The forward march of technology relies on continuous improvement of critical components such as semiconductors, batteries, fuel cells, and the like. In time, every component runs up against performance constraints established by fundamental physics and chemistry. Overcoming those restrictions requires the development of unique advanced materials that circumvent such limitations. Discovering and optimizing these types of new materials is difficult because the range of variables creates an enormous design space that is difficult to explore efficiently. Combinatorial deposition refers to a process of creating many advanced material candidates on a single substrate without removing that substrate from the chamber during the deposition process. The technique is not new in concept, but the remarkable advancements in deposition chamber capabilities and controls are making combinatorial deposition easier to implement. We refer to the process of developing advanced materials using combinatorial deposition as the "material discovery funnel." 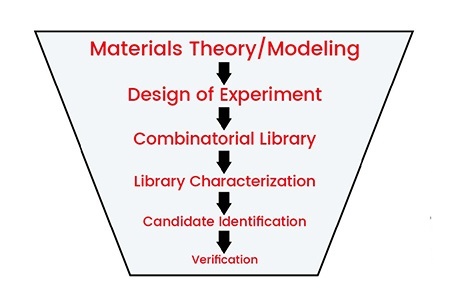 Material Theory/Modeling – Based on established knowledge of thin film chemistry and physics, hypothesize which combinations of materials, thicknesses, and structures may yield the desired performance for a given application. Design of Experiments –Develop a film-deposition procedure that varies all coating parameters in the most efficient manner to ensure that the entire range of interesting combinatorial composition appears within the test substrate. Combinatorial Library –Implement the deposition procedure to create a library of test pads on the substrate, with each test pad comprising a unique combination of stoichiometry or structure. Library Characterization –Conduct relevant tests on each test pad within the library to determine how well each deposition film meets the desired performance criteria. Candidate Identification –From among the test pads, identify the subset of deposition films that perform within the established performance tolerances. Verification–Reproduce the candidate films to confirm their behavior. In many cases, the verification process may also best be performed using combinatorial deposition. Following this six-step material discovery process makes the combinatorial deposition process considerably more efficient and repeatable. By creating an array of material combinations on the same substrate, it is possible to explore the effect of several variable combinations in a systematic fashion without opening the chamber and introducing uncontrolled changes to the experiment. The combinatorial deposition method is also much more time-efficient, not requiring venting and pumping the chamber back to vacuum between coatings. The faster that effective advanced materials are developed, the faster they can be put into play in methods that surpass the physical limitations of existing materials. This continued evolution ensures that device manufacturers will be able to meet the demand for faster, less expensive, and more powerful devices for the foreseeable future. @ Copyright 2019, PVD Products, Inc. All rights reserved.